Life As It Should Be: Burn it Up? There was a timeless scene in waiting to exhale, where Angela Bassett takes her husbands clothes outside puts them into his Mercedes Benz and sets that sucker on fire. Ohhh how the women cheered in the audience. After 11 years of sacrifice (Mary J. Blige "I'm not gonna cry...soundtrack for the movie) he decided he was going to leave her for his other woman. 90% of us woman and 50% of men have all been done this road before, but my question is should we start setting things on fire? The rage and emotion of finding out you're not the only one and on top of that you're no longer the "one" can be detrimental, but is it an excuse to be destructive? I think not. I believe, like I have said before in Karma, eventually the bed that you make, you must lie in. The busting out the windows and cutting up the clothes takes up to much energy and is really childish. You actually allow that person to hurt you more by dwelling on whats' been done. The energy spent crying and yelling and breaking things can be spent picking up the pieces and moving on. 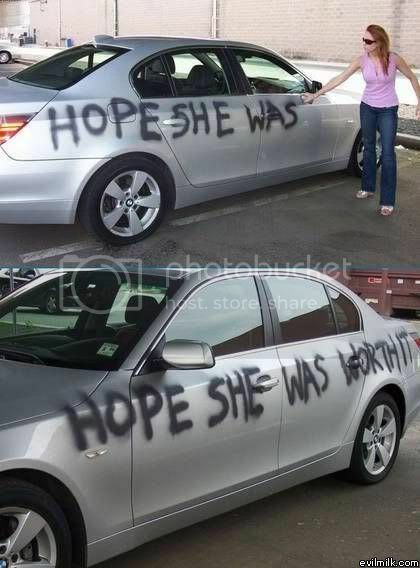 LMAO I WOULD LOVE TO SPRAY PAINT MY EX BOYFRIEND CAR..JUST FOR THE HELL OF IT..